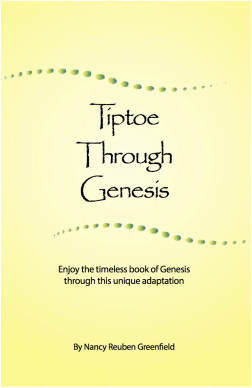 You can start to read the Five Books of Moses at any age, any time and any place! For the greatest impact, start with Book 1 (Genesis), Chapter 1 (Bereshit). And don't forget the special treat after sharing Torah --- that's what makes it "Tiptoeing Through The Torah!" Most of my chapter adaptations are a single page, including questions and illustration ideas. The language and content is simple enough for children and detailed enough for adults. If you want to read on the weekly Torah cycle, click Schedule for current portion. May Tiptoeing bring you much happiness and joy!